Alan W. Clark & Associates is proud to continue to represent victims of workplace injuries with the help of our affiliate firm, Pasternack, Tilker, Ziegler, Walsh, Stanton & Romano, LLP. Having a Workers' Compensation case in New York is different than a lawsuit in conventional Court. The law of New York bars lawsuits against Employers for injuries occurring on the job except in special, limited circumstances. All disputes in Workers' Compensation claims are adjudicated by Administrative Law Judges at the Workers' Compensation Board which has locations throughout Long Island, the five boroughs of New York City and the remainder of New York State. While there are no formal rules of evidence or pleading required by the Board, the law that applies to monetary benefits, medical treatment, permanent injuries and other issues has become increasingly complex since the overhaul of the New York Workers' Compensation Law in 2007. Especially of concern are the Medical Treatment Guidelines of 2010, the first of their kind in the history of the Workers' Compensation Board, and the 2012 Guidelines for Determining Permanent Impairment and Loss of Wage Earning Capacity. The Medical Treatment Guidelines of 2010 apply to all work-related injuries to the neck, back, shoulder and/or knee without regard to the date of your injury. While these guidelines result in preauthorization for many expensive diagnostic procedures and some surgeries which required carrier or Board approval in the past, the Guidelines also place strict limits on the frequency and duration of many less expensive treatments, such as physical therapy and chiropractic care. The Board's 2012 Guidelines on Permanent Impairment introduce a brand-new methodology for calculating the degree of permanency in non-schedulable claims that places a new emphasis on the worker's educational and vocational abilities which were often not addressed in the past. Retaining an attorney who is well-versed and familiar with the new laws and guidelines that have flowed from the 2007 overhaul of the New York Workers' Compensation Law is vital to ensuring your rights are fully and zealously protected at the Workers' Compensation Board. Unlike other types of cases, attorneys' fees in Workers' Compensation claims are always subject to the approval of an Administrative Law Judge, are deducted from the claimant's award and are payable directly from an Employer or Insurance Carrier to the claimant's attorney. The basis for a fee is the quality and quantity of work that an attorney has performed to obtain a favorable result that "moves money" to the claimant. While there is no hard, fast percentage of a claimant's award that is automatically requested or approved, it is customary for attorneys in New York to request 10 % to 20 % of the money that moves to the claimant as a result of the work the attorney has performed as an attorney fee. Attorneys' fees are also customarily granted when an attorney demonstrates the claimant's right to an ongoing monetary benefit at a hearing. 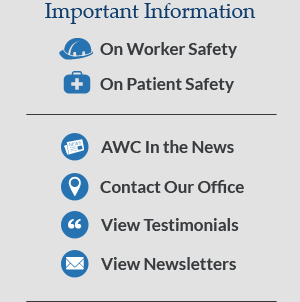 The number-one priority of the Workers' Compensation attorneys and staff at Alan W. Clark & Associates is to provide you with outstanding advice, education and personal service to enable you to make well-informed decisions that will serve your best interests in your Workers' Compensation case. If you retain our firm, your matter will be handled by an experienced attorney and staff member that handle Workers' Compensation cases only, that will maintain a familiarity with you and your matter, that will treat you with respect, and that will be able to articulately and accurately explain the status of your matter and what outcome(s) are likely and how they will affect you and your case. Please call or email our firm today for a free initial consultation regarding your Workers' Compensation claim. The New York Workers’ Compensation Board has implemented revisions and additions to the 2010 Medical Treatment Guidelines as of March 1, 2013. Perhaps the most important change to these Guidelines includes a provision that will allow for 10 annual sessions of “maintenance care” for claimants who have reached maximum medical improvement. For our clients who have been classified with a permanent partial or permanent total disability, this is a significant development. Whereas the original Guidelines eliminated any and all “palliative” care, “chronic care” or any other treatment in excess of those limited durations of treatment permitted in the original 2010 Guidelines, now claimants with permanent injuries will be entitled to a modicum of respect in the form of 10 sessions of physical therapy, chiropractic care or other forms of “maintenance care”. The revision does not permit 10 sessions of each type of maintenance care; it allows for a combination of the different types of maintenance care not to exceed a total of 10 sessions. This is a much-welcomed relaxation of the original Guidelines and a tacit recognition that claimants with permanent injuries can benefit from ongoing care. Another massive change to the Medical Treatment Guidelines includes a whole new set of Guidelines for the diagnosis and treatment of carpal tunnel syndrome. Interestingly, the carpal tunnel Guidelines also include a description of factors to be considered by healthcare practitioners in formulating an opinion on whether the carpal tunnel is related to the claimant’s work activities. The existing Guidelines have no such factors to consider for the other bodily sites that were included in the original 2010 Guidelines, including the neck, back shoulders and knees. Please contact us now for a free consultation on how the newly-revised Guidelines affect you, whether you are an existing client or you are contacting us for the first time.